This project was created several years ago and has developed into a lovely mature garden. Originally the property was spread over two adjoining blocks of land – one almost entirely taken up by a rarely used tennis court. We removed this and created an enormous tropical formal pool and a cool green formal lawn in place of the tennis court. Despite its location I designed a structured garden to contain the exotic plantings with vistas and formal pathways leading to different areas and creating a journey around the property. 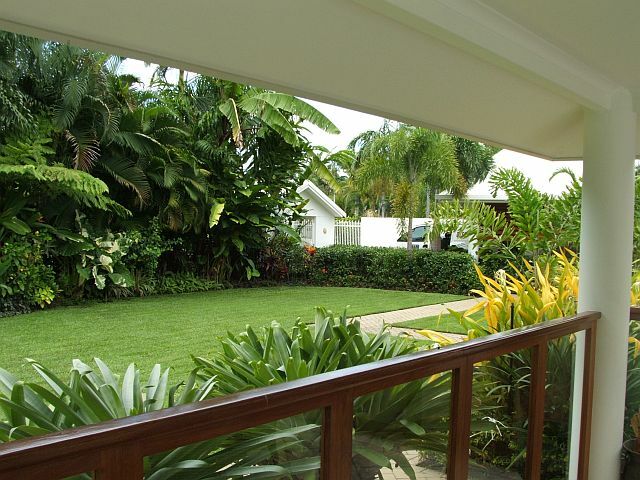 We have used a huge variety of ‘Hawaiian-tropical’ style planting to create dense planted screens to hide the house from the roads as this type of planting thrives in the humid Port Douglas climate. Although I tend to use fewer palms these days, they still have their place if used carefully with other shrubs in tropical gardens such as this. The owners have firmly stamped their own personalities on this project and the blend of tropical with classical styles has created a very unique garden. In one of the most tropical and lush landscapes for Australian towns, I was impressed to see that creating “a touch of whimsy” in the garden extended to using statues of sheep. This was a fun garden which was designed for and with a family. A great project to be involved with.